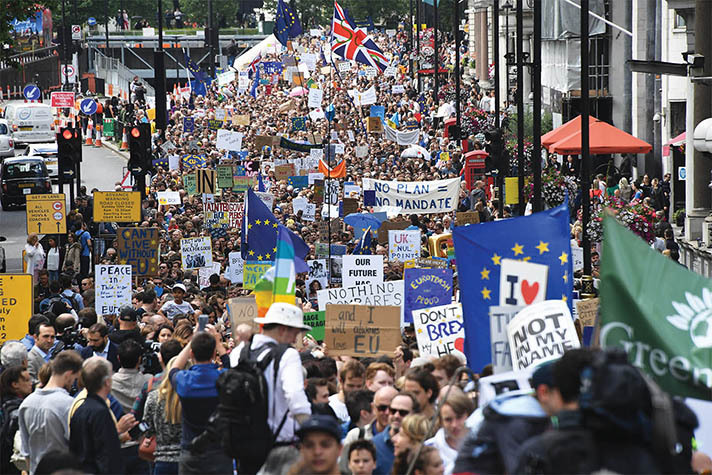 Protesters participate in an anti-Brexit march in London. The continual unrest in the world’s cities stands in stark contrast to the promise of the Heavenly City. Some years ago, on a visit to Charlotte, N.C., my breath was taken away when I was awarded the Freedom of the City by Mayor Harvey B. Gantt. It was the most generous and undeserved civic honor of my life. But there is another City of which the Bible speaks! In a fragmenting world—with America facing its crucial presidential election and Britain in flux after its recent referendum decision to quit Europe—there is a single heavenly citizenship that alone can reassure us. Breathtaking, indeed, was what the early Christians of Philippi learned from the imprisoned Apostle Paul: that despite their lowly status within a proud colony of Rome, they had the freedom of the city of Heaven! And that is the privilege of every believer. My name went into the book of “Zion City” the day I received Christ. My birth certificate—or should I say my new-birth certificate—was made out for me that very day—and nothing is going to alter it! Abraham foresaw this city! This nomadic wanderer “was looking forward to the city with foundations, whose architect and builder is God” (Hebrews 11:10). “Glorious things of thee are spoken, Zion City of our God,” says John Newton’s hymn, taken from Psalm 87. Yet, that psalm also lists various ungodly regions: Rahab and Babylon, Philistia, Tyre and Cush. Here was one of many prophecies that God would draw into heavenly citizenship people from the most unpromising backgrounds. Augustine’s book rejuvenated and shaped Europe for the next thousand years. The city that is from above … Paul, in tingling expectation, adds, “And we eagerly await a Savior from there, the Lord Jesus Christ” (Philippians 3:21). Caesar Augustus would have been unaware that the only reason his name would ever be preserved would be to help date the birth of a little boy, born during his reign, who would become savior to millions of people around the world and through the ages. The Savior we await will return historically, bodily, visibly and universally—to usher in the eternal kingdom, as the saints of God finally stand over the grave of smoking Babylon (Revelation 19:3). With the returning Savior on His way, how will He find us? In our waiting, we are to be hard at it, in consistent living and witness to our dying world. If we don’t do it, nobody else will! The cross—and its inspiring sequel, the resurrection—this is enough to unite the world at the feet of a single individual. Here is the transforming power that has created the widest-ranging family of belief ever seen. The truth of this was clearly demonstrated at the Amsterdam 2000 congress for preaching evangelists, organized by the Billy Graham Evangelistic Association. Some 12,000 of us were gathered together from 209 nations—a bigger span than either the Olympic Games or the United Nations. It culminated in a wonderful service of the Lord’s Supper. Think of it! The most internationally representative gathering—secular or religious—in all history was a communion service, where we sat at the feet of the once-crucified, then raised, and now coming, Savior of the world! Can there come about a lasting unity that straddles every different grouping? 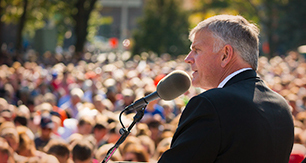 The Bible says it is already here—through the leadership of one Man.